Last year, before running the Flower City Half and abandoning the idea of running a spring marathon completely, I had narrowed my choices for a May 26.2 to three possibilities: Ottawa if there was extra money in the budget, Buffalo if there was no money at all, or Burlington if there was just a fistful of dollars left over after paying the man his monthly dues. 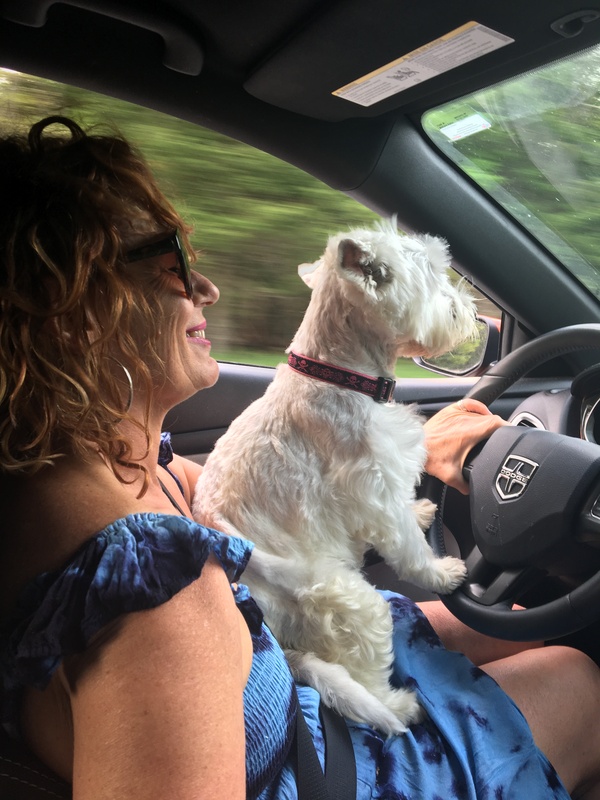 This year, the financial situation being what it was, I was down to the same three choices. 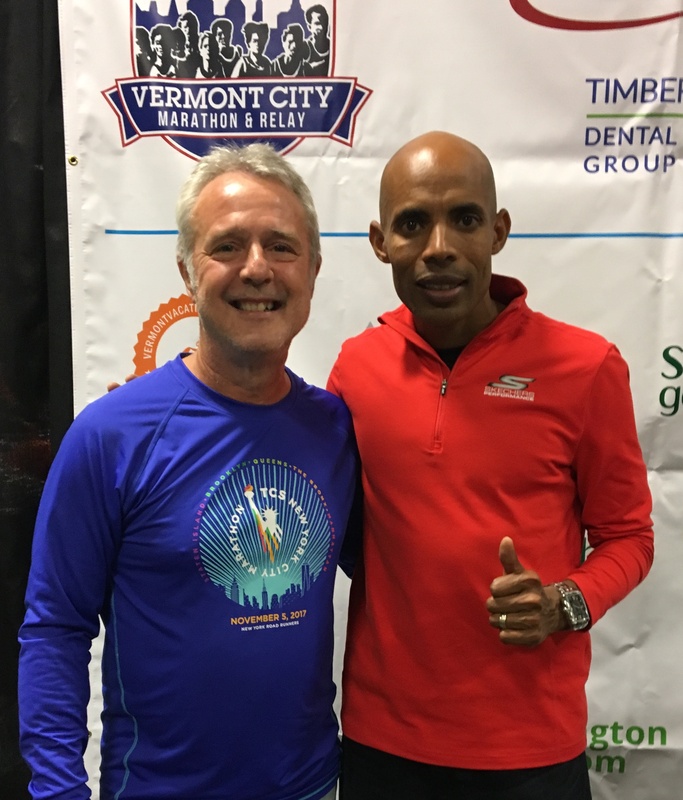 But when RunVermont announced in January that Meb Keflezighi was going to be the guest of honor at the 30th Annual 2018 Vermont City Marathon, I knew there was really only going to be one place I was going to be on May 27. I mean, what dedicated marathoner would pass up a chance to meet the 2004 Olympic marathon silver medalist and the winner of the 2009 New York and 2014 Boston marathons (the only runner in history ever to manage all three feats)? After the New York half, I finally committed to the race. But for the month immediately following, I went totally off the Hanson’s script and registered some of my lowest training miles of any marathon I had run since Toronto. Weekly mileage deficits of 7, 10.8, 12.4, and 10 for weeks 10-7 respectively — big deficits by my usual training standards — had me seriously worrying that I wasn’t doing enough to prepare for the challenge ahead. Yet the #runstreak was continuing on. The whole training program was shaping up to be a great experiment: would the consistency and fitness levels produced by the #runstreak be able to replace the lost overall mileage of the Hanson’s method? After Florida, I threw myself back into training mode. But to make matters worse, with time running out, I could only fit in three long runs. And none of them were terribly convincing. Long run 1 (#runstreak day 96) was a 16 miler that went well up until mile 10, where I bonked and walked. I managed to rally slightly, but the last three miles were slow walk/runs. In the end, at 9:04 min/miles, my overall pace was flattering to say the least. Long run 2 (#runstreak day 110) was a 20 miler along the Erie Canal. This time, I was good through 16 miles, but I bonked again and walked/ran the last four. But, like the first long run, the overall pace of 9:10 min/miles covered an otherwise sucky performance with a thin veneer of positivity. Long run 3 (#runstreak day 125) was by far the most convincing long run of the program. I may not have completed the full 20 miles I had intended to run — I only managed 19.43 in the end — and at 9:13 min/miles, it was the slowest of the three. But I was much stronger through 13 miles and rallied through a rough patch at mile 14 before finally capitulating at mile 19. The most encouraging area of the training, though, were the 10-mile Thursday tempo runs, which got progressively faster as May went on, going from an 8:25 min/mile on #runstreak day 123 to an 8:20 on #runstreak day 130 and a staggering (for me) 8:00 on #runstreak day 137. Even in 2015 — my PR year — I hadn’t managed to sustain that kind of pace over that distance. and sped toward Vermont on #runstreak day 145, maybe #runstreak was going to win out after all. #runstreak day 146. As luck would have it, our AirB&B was on Starr Farm Road, about 100 yards from the Burlington Bike Path and right after the place where mile marker 23 would be the following morning. So, for a couple of miles, I ran my premarathon shakeout on the trail to Leddy Park and visualized running fresh and strong over the last few miles the following day. It was an image that was to serve me well 24 hours later. But before then, I had a date at the race expo with Mr. Keflezighi. After picking up my race packet, I stood in line for about 50 minutes to meet the man. 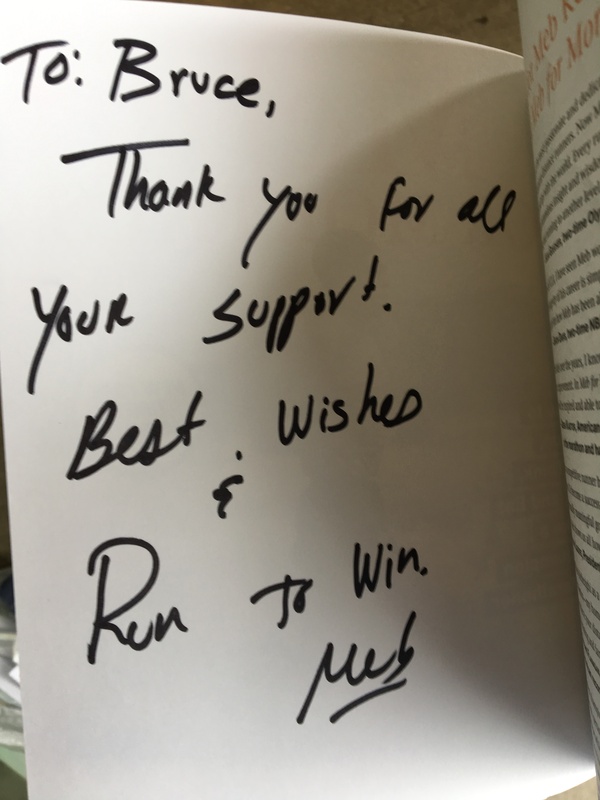 I expected a quick photo op, an even quicker autograph in my copy of Meb for Mortals, and very little else. and this cool inscription in his book. But nothing prepared me for what happened next. As he was signing, I attempted a little casual chitchat, telling him that I was taking his words about goal setting in the first chapter of the book to heart. “You’re going to help me qualify for Boston,” I quipped. Gobsmacked, I shook the man’s hand and walked away with a cheesy, geeky fanboy smile on my face. The advice was too late to take for the following day, of course. But the great Meb had just rekindled in me a dream that, after the last few years, I had thought was dead. That night, I went back to the AirB&B and went through all my usual preparations. Everything went exactly by the book, and by the time Tessa dropped me off at the start line, my confidence level was sky-high. All doubts about the effectiveness of my preparation and the pros and cons of the great experiment disappeared from my mind. All I had to do now was run 26.2 miles. #runstreak day 147 was as good as in the bag. 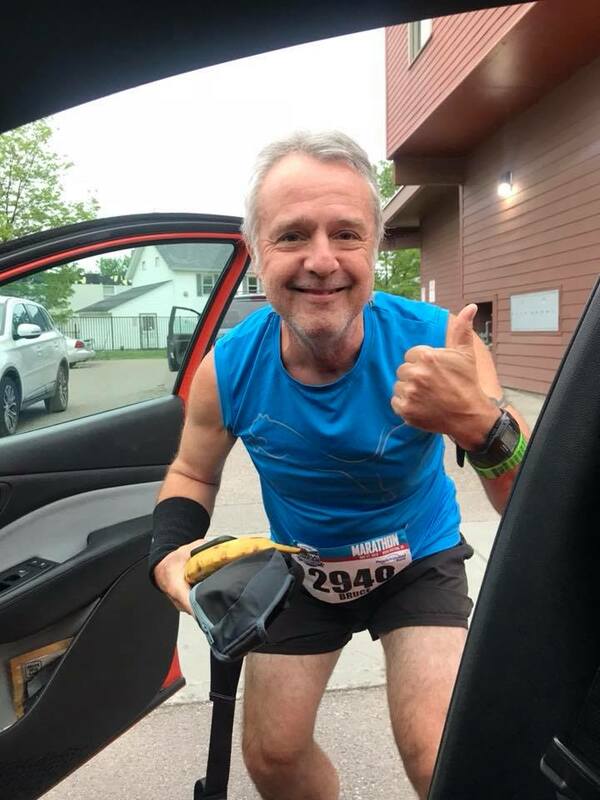 This entry was posted in #runstreak, The Flat-Footed Fox and tagged Hanson's Marathon Training, long-distance running, Meb Keflezighi, Vermont City Marathon (Burlington). Bookmark the permalink.